Uncover the history and secrets of Fonts & Characters ! Immerse yourself in this fascinating and unique experience to uncover the history and secrets of Fonts & Characters ! Incarnate 2 dots and travel through the ages of typographic styles and techniques. From the rock paintings of prehistoric times to Pixel art of the 2000’s, solve all the riddles by riding the most popular fonts and characters (Garamond, Helvetica, Times New Roman, Pixel, Comic Sans...) in a very captivating musical and visual environment. 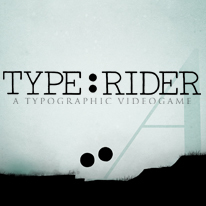 Type:Rider is an adventure puzzle game that brings gaming experience to a whole new daring level!